When it comes to making a deposit to play online keno, whether you’re using your computer, smartphone or tablet, Neteller provides a quick and safe way to fund your keno account. Neteller comes under the realm of what’s known as a web wallet (or e-Wallet), an online payment service that allows players to store their banking and personal information in a secure online location. When you sign up for a Neteller account, you’re given a secure user ID and password, the details of which can then be used to fund your online keno account without having to hand over your banking details to multiple sites. Neteller transactions are safe, free and funds are available immediately, making this highly trusted web wallet service a great choice for online keno players. What keno sites accept Neteller deposits? 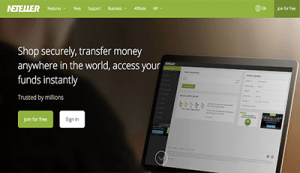 Make a deposit at keno sites using Neteller. Each of these keno sites is protected by a minimum of 128 Bit SSL security encryption, so with the added layer of security provided by using Neteller, you can play real money keno with the peace of mind in knowing your personal financial details are completely secured. Head to Neteller.com and sign up for an account. This will only take a few minutes, requiring the usual details like your name, address and contact details. You’ll also be asked to choose your preferred currency method, so make sure to select AUD to avoid foreign transaction fees. You’ll then need to choose a payment method to deposit funds to your Neteller account. Aussies can choose between Visa, MasterCard, Skrill, POLi, or direct bank transfer. You’ll also be given the option of storing your payment details for future transfers. Enter the amount of money you wish to transfer to your Neteller account, follow the prompts and presto, your money is now in your Neteller wallet ready to be used to play keno online. Head to a secure keno site like G’Day, Guts or Emu Casino. Sign into your account if you’re an existing user or create a new account, taking advantage of any welcome bonuses along the way. Head to the casino cashier, select Neteller as your deposit method. Enter your Neteller login details as requested, along with the amount of funds you wish to transfer from your Neteller account to your keno account. Done – Neteller deposits are available immediately, so now you can head straight to the keno game you want to play and start making your picks. Security – Neteller is backed by a stringent security team, with someone available to speak to 24/7 if you ever require help. Neteller uses the latest in anti-fraud and security technology to ensure your personal details are never compromised. The company is authorised by the UK Financial Conduct Authority (FCA) which holds all user funds in secure trust account, meaning your money will always be available to you when you want it. Availability – unlike some deposit methods like bank wire transfers which can take 24 hours or more to appear in your casino account, Neteller transfers are available immediately, so you can play real money keno online whenever you want, wherever you want. Neteller is also available for mobile, so you can make secure transactions using your smartphone or tablet. Neteller rewards – Using Neteller to play keno comes with the added feature of earning you rewards, a benefit you won’t find from many other keno deposit options. Neteller users are privy to special promotions that include cash prizes, all expenses paid holidays and other real world prizes. You’ll also earn Neteller reward points every time you move money in or out of your account, which can later be redeemed for cash. These Neteller rewards are also met with loyalty reward programs offered by keno sites like G’Day, Guts an Emu Casino, meaning that playing keno online gives you much more for your money than playing in a bricks and mortar venue. Keno sites like G’Day Casino each offer Neteller for withdrawals, so you can transfer any money you win playing keno back to your Neteller account. Once the funds are back in your Neteller wallet you have the option of leaving them there until the next online transaction you wish to make, or you can cash-in your Neteller funds using bank transfer (which has a processing fee of $15 for Australians and will take three to ten business days) or request a cheque to be drawn, which will take from two to 21 days. Our top-recommended keno website which supports Neteller as a deposit option is GdayCasino.com. Sign up now to play the very best real money keno games on your computer or mobile device in AUD currency – no need for currency conversions.